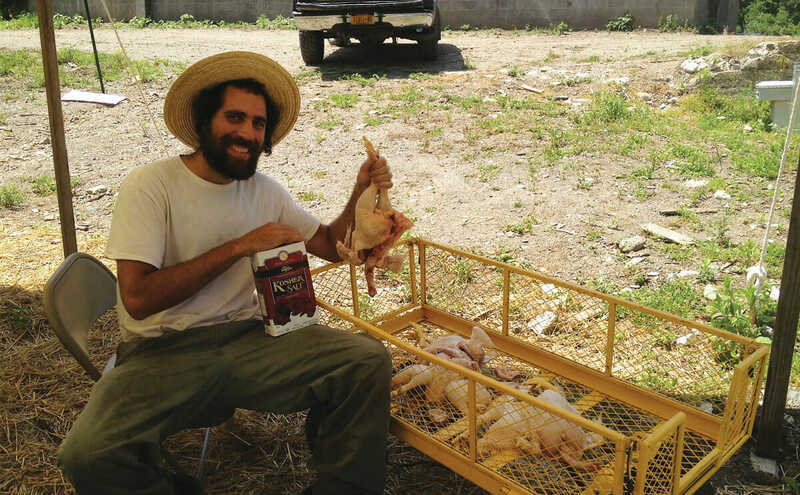 At The Yiddish Farm Education Center, an organic farm and school in Goshen, NY, students live sustainably while participating in intensive Yiddish immersion programs. Were you to visit the farm in Goshen, New York, just 50 miles from Manhattan, it would look like any other upstart hipster back-to-the-land project. A chicken coop, a handful of sheep, a charmingly run-down farmhouse. But get a little closer, and you’d see that the twenty-somethings clearing brush and tending the fields are not speaking English. Those throaty “k”’s and guttural “ch”’s? Yup, that’s Yiddish. Yiddish, the language that brought us such undeniably delightful words as “schmuck,””chutzpah,” “nosh,” “mensch,” “kvetch” and “schmooze,” has been on a steep decline for the past 75 years. On the eve of World War II, it was a robust language spoken by 11 million Jews in the United States, Europe and beyond. In New York there were Yiddish theaters, Yiddish newspapers, Yiddish political societies. Today there are only perhaps 600,000 Yiddish speakers worldwide, some 250,000 in the United States, mostly elderly European-born Jews or the ultra-Orthodox. Yisroel Bass wasn’t satisfied with this. Bass, 24, had been fascinated with Yiddish since teaching himself the language as a teenager on Long Island. His family wasn’t especially religious, but he saw Yiddish as a way to connect with his Jewish heritage, and he wanted to be around other people who felt the same way. Recently graduated from college and living in New York, he dreamed of finding a place outside the ultra-Orthodox world where Yiddish could be used as a language of everyday life. After reading about 20th century Jewish agricultural movements, Bass and a friend, Naftali Schaechter Ejdelman dreamed up the idea of starting an all-Yiddish farm. A farm seemed like a perfect format for nurturing language immersion, the pair thought, since people would be living and working in close quarters, all towards a common goal. And earning some money on crops wouldn’t hurt either. In 2011, Bass and Ejdelman leased the property in rural Goshen, about an hour’s drive north from New York City. Bass got to work immediately, clearing brush and fixing up the battered farmhouse. By summer of 2012, he and Ejdelman were ready to welcome their first batch of students. That summer, they had 25 people attending a live-in summer program on the still-under-construction farm, studying, sharing kosher meals, sleeping in tents and RVs. Ejdelman taught Yiddish lessons, while Bass worked the land. Most of the students were twenty-somethings, some from religious backgrounds, some from secular ones. They stayed on the farm anywhere from a weekend to 10 weeks. Words like “irrigation” or “tractor” or “zucchini,” perhaps, since all students spend four hours a day working on the farm. In its first summer, Yiddish Farm grew a variety of vegetables, including squash, Yukon gold potatoes, popcorn, tomatoes and beets. But their best crop by far was garlic, which grows wildly in the famous “black dirt” of Southern New York State, once the bottom of an ancient glacial lake. They had barely any equipment beyond “a yellow wagon, a generator, and some tools borrowed from a neighbor,” Bass says, but everything worked out in the end. This year, Bass is focusing on garlic again, some of which Yiddish Farm turns into pesto. They’re hoping to start a garlic CSA as well. Bass is also working out the logistics of a new crop ”“ wheat. This wheat, he hopes, will eventually be used to make organic matzo, the cracker-like unleavened bread eaten by Jews during the springtime observance of Passover. 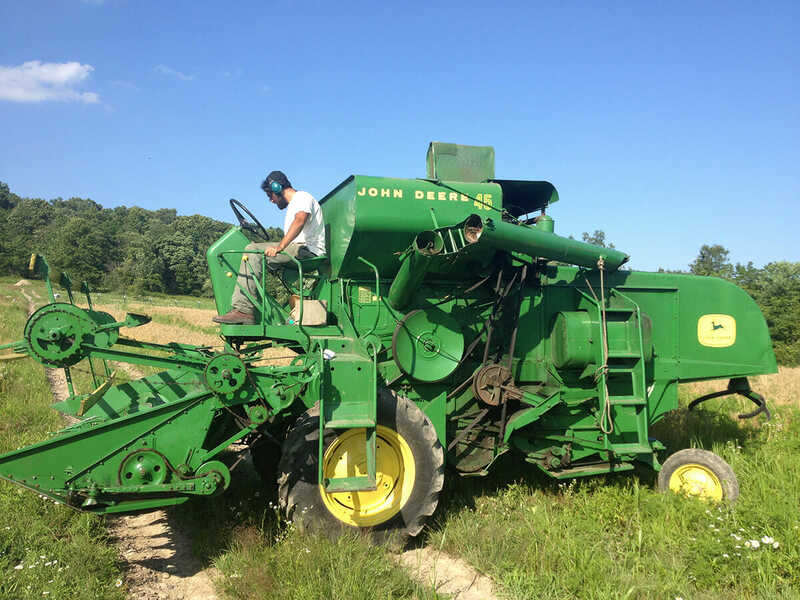 He’s already bought a used combine off eBay and taught himself to use it. Growing kosher wheat for matzo takes some special planning, though. A rabbi must inspect the wheat for any signs of sprouting, which happens if the field gets wet right before harvest. On the rainy East Coast, this is almost impossible to prevent, which has driven some ultra-Orthodox Jews to grow their matzo wheat in arid Arizona. The farm just completed a successful second summer Yiddish program. Eventually, Bass and Ejdelman hope to run programs year-round, and dream of one day turning the farm into a permanent Yiddish-speaking community. To that end, they’re hoping to bring guests out for some all-Yiddish locavore Sabbath dinners this fall, roasting the chickens they’re planning to slaughter next week ”“ in the kosher manner, of course. To them I say: zol zayn mit mazel! (Good luck).